Rodney M. Elliott, a member of city councilors and a former Lowell mayor, talks to VOA Khmer about at-large election system. When residents of Lowell, Massachusetts, vote Tuesday, they’ll be exercising their civic responsibility against the backdrop of a lawsuit that will pit the city against its minority citizens. In a city notable for its diversity — taken together, ethnic minorities almost form a majority — Tuesday’s contests for City Council and school committee are playing out against a voting rights lawsuit 13 Asian-American and Hispanic residents filed against the city in May, an action that echoes others elsewhere in the United States. On Oct. 17, at the first public hearing on Huot v. City of Lowell in U.S. District Court, Judge William Young denied the city’s motion to dismiss. The suit alleges the city’s at-large electoral “winner-take-all” system dilutes the minority vote and discriminates against candidates from minority communities. Young’s decision means the city government of Lowell is likely headed to trial against some of its minority residents. The judge’s decision was expected, said Oren Sellstrom, a lawyer for the plaintiffs’ suit and a litigation director of the Lawyers’ Committee for Civil Rights and Economic Justice. A trial date has yet to be set, he said. The lawsuit will not affect this year’s elections, or change the city’s form of government with a city manager and a mayor elected from the City Council, or guarantee that minority candidates would win. But within Lowell’s 11 wards, three neighborhoods are notable for their concentration of minority residents, and parts of the three neighborhoods could be drawn as a district that would be comprised of Asian-American and Hispanic-Latino voters, Sellstrom said. Almost half of Lowell’s total population, 49.2 percent of about 110,000 people, are minority. 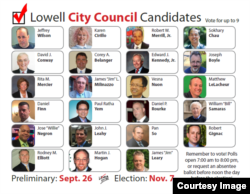 Currently, nine members of Lowell’s City Council and six members of its school committee (the city’s version of a school board) are white. Only four Asian-American and Hispanic candidates have ever been elected to the City Council. None have been elected to Lowell’s school committee. 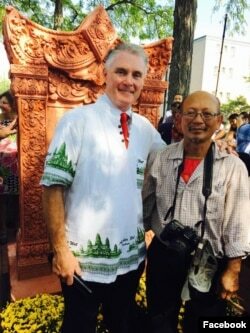 Rodney Elliott, a former city mayor and a city councilor of Lowell (left) and Mr. Yary Livan, a ceramist and a teacher at Middlesx Community College, attended the inauguration of Khmer Refugee Monument, at Lowell City Hall, Sept. 24, 2017. “I think we need to change the way that we elect our city leaders to be more reflective of certain population as well as geographic representation of those sections in the city,” said council member Rodney Elliott, who brought the need for district representation before the council in 2009. Elliott’s effort failed when no one backed his motion to have the council discuss an option of adopting a mixed system of citywide and district representation. But an election law expert in California, the U.S. state with the largest minority population, warned of key legal challenges facing the Lowell plaintiffs. “It is not always easy to win cases under the Voting Rights Act, even when minority groups are large,” said election law expert Rick Hasen, who is a chancellor’s professor of law and political science at UC Irvine School of Law in California. The at-large system discriminates against minority voters “when there is racially polarized voting,” Hasen said.” If people from communities of color tend to vote for different candidates, then “it is fairer” to use district representation. Elsewhere in the U.S., residents of many small cities with Lowell’s majority-minority demographic profile, have brought suits against their city governments. The movement has been particularly visible in California, where cities are changing their voting and governance to reflect demographic shifts. For example, in 2015 California’s Garden Grove found itself facing the same kind of voting rights lawsuit when some Latino residents, a group that is about 36 percent of the population of 175,000, went to court. In 2016, the Garden Grove City Council opted to change its electoral system from citywide voting to district representation, leaving only the mayor to be elected citywide. “Changing to district elections gave a better chance for Latino representation on the City Council,” said Stephanie Klopfenstein, a City Council member who was elected in 2016. Yet more is needed to give minority voters a voice, even with the move to district representation, said Tyler Diep, a Vietnamese-born member of the Westminster City Council in California’s Orange County.